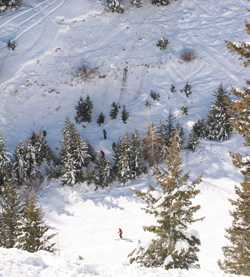 Express photo by Todd Kaplan A skier on Bald Mountain’s Lower Broadway run travels below the avalanche that claimed the life of Warm Springs resident Tim Michael, 54. What matters more, plaza or parking? The politician-as-hunter cliché has bloody well run its course. Skepticism is the proper attitude toward any assertion.